What may seem like an annoyance to some people is, in reality, a potentially serious dental condition. It's called bruxism or night time tooth grinding, and while the noise may drive a spouse or parent crazy, the real problems are wear, damage to tooth enamel and related medical conditions. 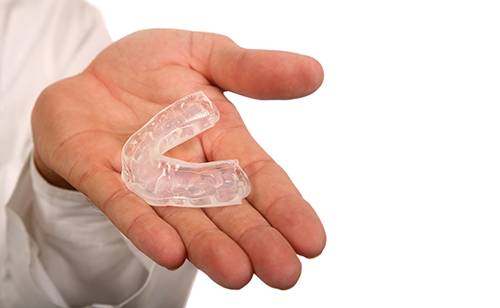 Fortunately, dentists can offer patients a simple and relatively cost-sparing solution called a night guard. Your dentist may be able to help with tooth grinding. After an oral examination to pinpoint causes and possible treatments for bruxism, the dentist may recommend an acrylic or thermoplastic mouth guard fitted over the upper or lower teeth. While sporting goods stores and pharmacies sell over the counter and "boil and bite" guards to protect an individual's teeth from injury during sports and exercise, these devices are generally not considered adequate to treat a serious tooth clenching problem. A custom-made night guard fits a patient's mouth exactly because the dentist takes an impression of the teeth and sends it to a dental lab. A skilled technician fabricates the guard according to the impression and the dentist's instructions. Worn at night, a custom mouth guard separates and cushions the upper and lower teeth and significantly reduces the destructive forces caused by grinding. Some conditions related to tooth grinding may need more aggressive therapy. Some individuals need pharmaceutical muscle relaxants and relaxation therapies to control their symptoms. The primary physician and dentist are the best people to consult for a solution to tooth grinding. Brush and floss before wearing a night guard. Clean it with warm water and soap. Rinse it well before inserting it. Keep it in a perforated container to protect it and keep it flexible. Avoid storing it in extreme temperatures as this breaks down the material. Have your dentist check it for fit and wear when you go for your regular examination and cleaning. Doctors Susan A. Hockaday and Jim P. Baucom are the Charlotte, North Carolina dentists who evaluate your teeth and help you decide if a night guard is right for you. Experience, expertise and a desire to see you with a beautiful, healthy and long-lasting smile--that's what you'll find at with Hockaday and Baucom DDS. Call today for an appointment: 704-553-2348.